Discussion in 'Other Watch Brands' started by SLRdude, Sep 28, 2010. There is something about Doxa that always caught my eye, even though I can't really say that I find it terribly attractive. Perhaps the fact that it was one of the original dive watches? The co-invention of the He valve with Rolex? The first orange dive watch? No clue, but the more I look at this ugly thing the more I want one. And the more I look, the more I like the silver faced Searambler as opposed to the black Sharkhunter or orange Professional. I also favor the 1200 T, which is only 42.5mm as opposed to some of the other models which are 45. What do you guys think of Doxa? Not my pic, credit murphy77 of WUS. I agree on that color combo too. That's just the right about of color for a daily wearer and the bracelt looks super comfy too. Overall, there are not a lot Doxa's that I like, but that one looks sweet! I do wish they would make their minute hands a bit shorter / thinner though. Looks great. :thumbsup: As a Clive Cussler/Dirk Pitt fan though, the orange-faced Doxas are my faves. I agree, I do no think that it is a very good looking watch at all. But then again... I love my Bell&Ross Instrument and it does not get much uglier than that LOL. What I like about Doxa watches is that they are immediately recognisable. Very true to their heritage which is good to see. This one is a beauty too. I like it! Nothing else comes to mind that looks like a Doxa. And in this world full of copycats, originality is good. I wish the hour hand was the same thickness and color as the minute hand. :banghead: If that were the case, I'd really like it. That is a great looking watch! as the size is right for me! I tend to somewhat agree, from an aesthetics angle. However, being designed as a tool watch, the hour hand is irrelevant for a diver and they wanted a big size discrepancy for absolute visibility at a glance. It's a classic diver's watch. I love it. Was going to say the same thing re the almost 'irrelevant' hour hand, for divers! Minutes and seconds are all that count - at a glance, the minutes are all you want to see. As you say, a true tool watch. I like the look of it. Wow, that`s something that you don`t see every day (at least here in Serbia)! 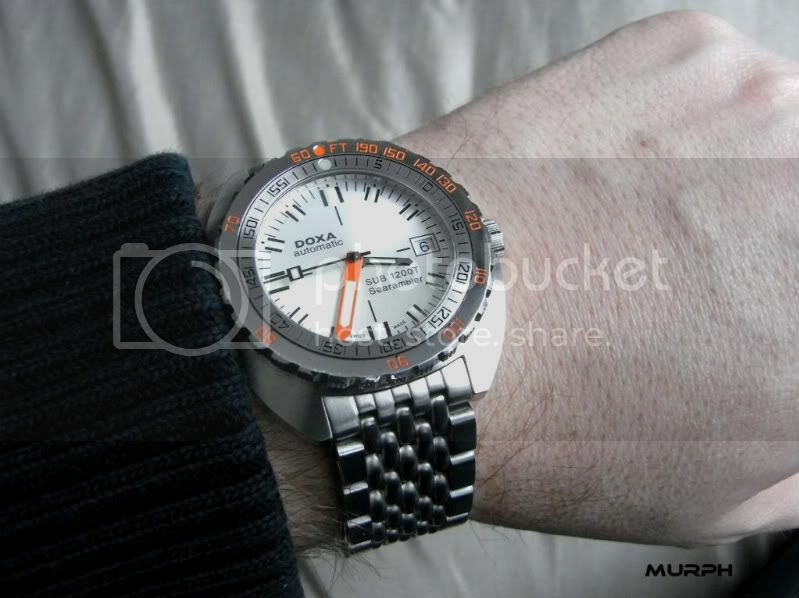 I haven`t see Doxa divers in person, I like it VERY much! looks cool, i could live with that. be happy, be nice or you get some of this!! I've got a 750T Professional (orange dial) and a 1000T Divingstar (yellow dial). The 750T is the larger of the two. Both wear very comfortably on the wrist, not unlike the Seiko 6309-7049 that I have. The Doxa's have the ETA 2824 under the hood, and run very accurately. The 750T is +/- 3 seconds over 24-hrs, the 1000T at +/- 15 seconds. Both are straight from the factory, never been opened. I found Doxa quite by accident 2-1/2 years ago when looking for a watch to use while my Seiko was at the spa. Many watches later, they are still two of my favorites. Find a nice pre-loved example, and you'll be quite pleased methinks. a tourist doesn't know where he's been.